Since the 18th century the original Coach House was situated at the rear of the mill owner’s house – Darkley House. This building housed the horse drawn carriage and was adjusted to become the base of the Action Community Employment (ACE) scheme in 1989. 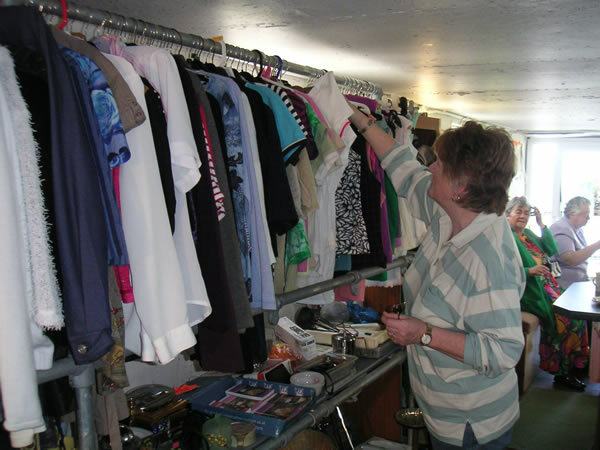 Since then it had incubated several community projects such as Worn Again, New 2 U, Yarn & Darn, The Singing Kettle and Darkley Club House. 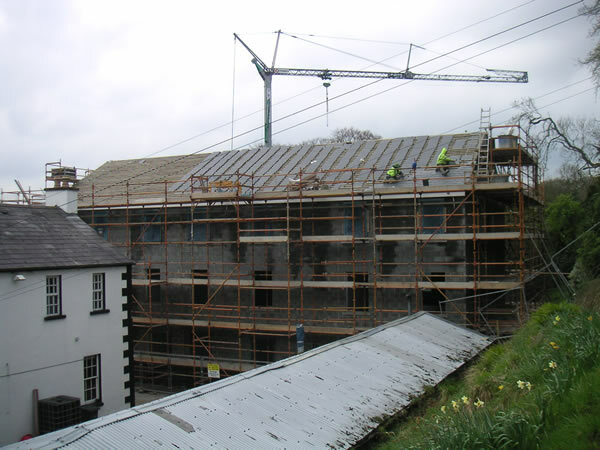 In 2005 Coach House Regeneration Ltd was born and plans were put in place to develop the Coach House into a new state of the art building, which would house a number of commercial units. The building would provide stimulating space for the social economy and incubation of small local businesses. 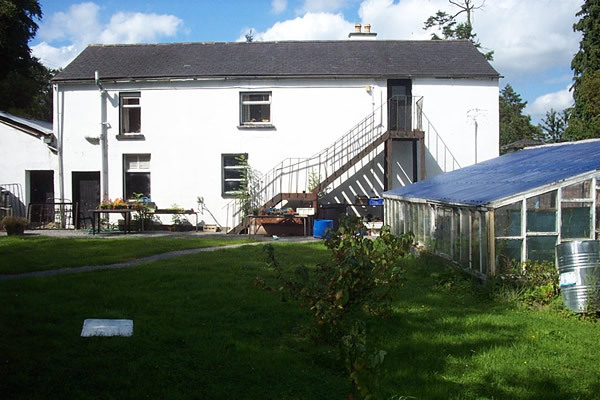 It was anticipated that some of the existing community enterprises in the original Coach House would be rehoused in the new building and blossom further in a business environment. After many planning and funding meetings the Coach House Regeneration building took the next step towards becoming a reality. 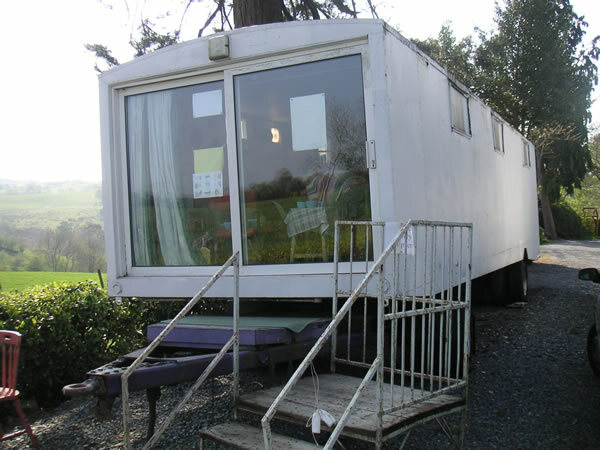 Worn Again was moved into the Care Wagon at the front of the property and the demolition started. By the end of the summer the original was completely demolished and the final steps towards agreeing the plans and the funding drew nearer. We were absolutely delighted when we received agreement and all the required funds to commence the building were in place. We will always be grateful to our financial partners in DETI, IFI and UCIT, plus all the individuals that donated and those who worked voluntarily on the demolition. The advice and input of our Project Manager Eddie Quinn (R E Quinn Architects) was much appreciated and along with the management team ensured that we stayed focussed to deliver a community business park. 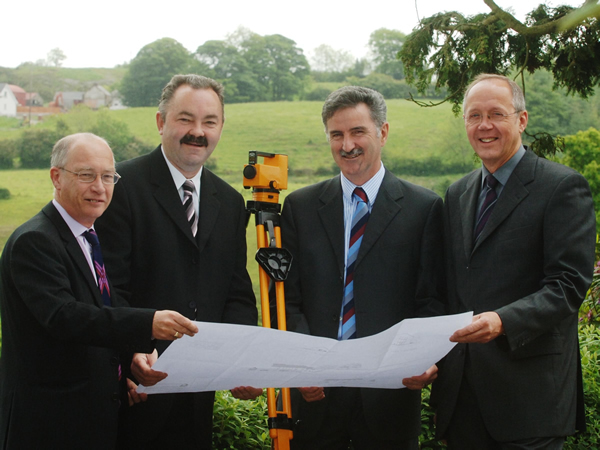 Viewing the site plans are: (l-r) Howard Keery (DETI), Ian Bothwell (Crossfire Trust), Denis Rooney (IFI) and Brian Howe (UCIT). After a few false starts the building work started at the beginning of January. Final ground clearance at the start of January. 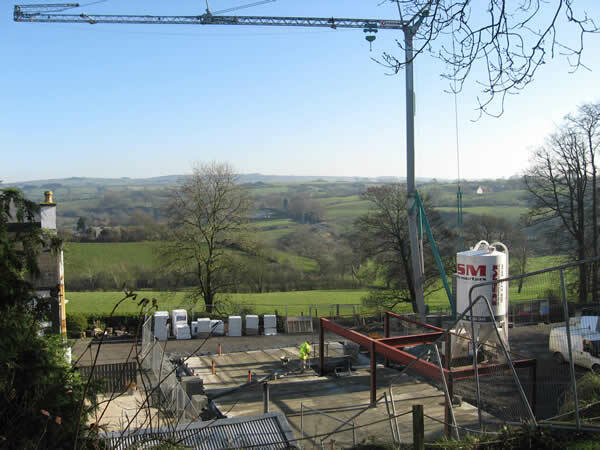 The remote control crane was installed and the works on the foundations started. The weather was kind to us which meant that the project remained on schedule. 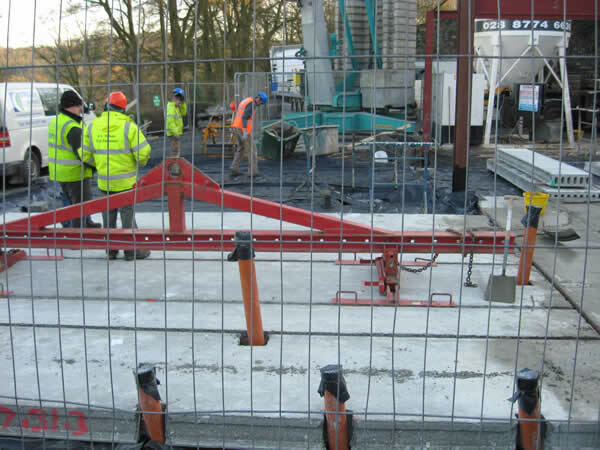 The foundations were finished and the steel structure work completed. At this stage the project was on schedule for completion in June. Building work continued at a rapid rate. 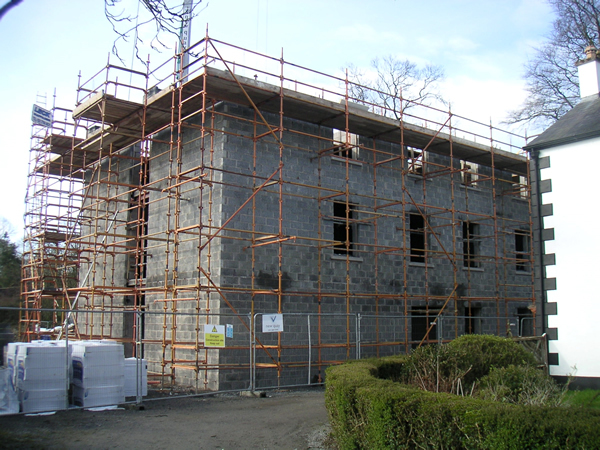 All three floors were completed and the building was starting to take shape. The roof was on by the end of April. The building was almost finished but the official opening of August 8 had to be postponed due to a slight delay in completion. Due to unexpected high levels of rain in late June and early July, the ground works for the bridge at the rear of the building could not be completed on time and so the official opening was postponed. Click here for more information. 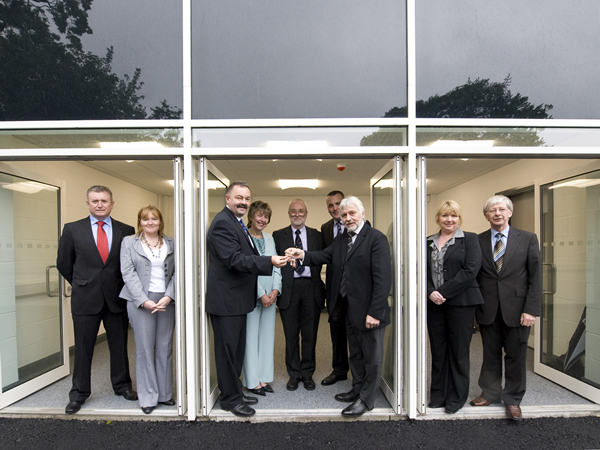 Friday September 5 saw the handing over of the keys by Adrian Quinn from New Quay Construction to Ian Bothwell. Click here for more information. 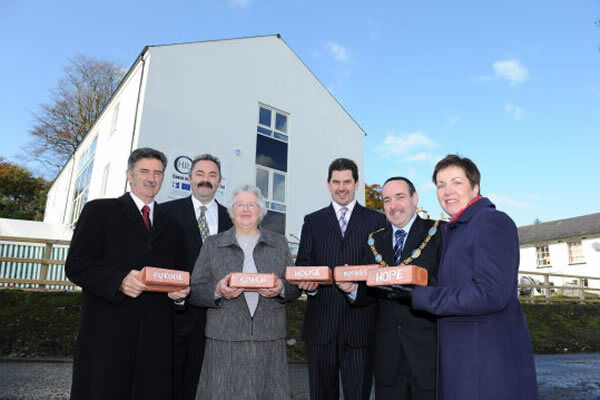 Thursday October 30 saw the official opening of the Coach House Regeneration building. Click here for more information.